I've been neglecting my blog. This is an Plein Air oil 11x14 on veneer that I did while fishing on the St. Mary's River in BC Canada. My horselogging partner and I chased Rocky Mt Cutthroat in this spectacular landscape. 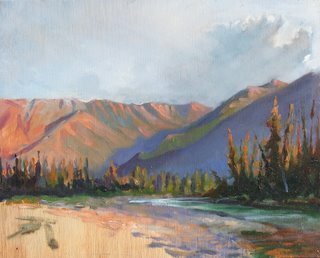 I never took down my easel for four days painting one picture looking at the sunrise and this one looking at the sun setting on the eastern face of the Purcells. It was great fishing until the Kokanee came up from the lake and chased all the cutthroat away. Since the Kokanee were there to spawn they weren't biting but it was a once in a life time experience to watch the green glacial waters turn crimson with Redfish! I'm off to paint fall colors in Maine as well as eat a lot of lobster and drink champaign. Tough life! but somebodies got to do it. Betts and I are headed to Bar Harbor, MA and will meet friends Kate and Peter there where we will rent a place for a week. We'll stop off in Boston and take in some of the museums. I'm hungry for some 'good' art. Some masterpieces that will ramp up my aspirations. It's like playing music with another musician that is much better than yourself and makes you better by association. I've been painting the fall colors in the Sanpoil which are glorious and will be hard to compete with. I just came from a meeting on the coast and the fall colors around Mt. Rainier, especially the big oaks around the cow pastures of Randall were hard to pass up. I did a little sketch of Rainier from Chinook Pass just because it was clear and I wanted the landmark in my journal.